The country’s oldest toy store, Ram Chander and Sons (RCS Toys), proudly stands next to the erstwhile Odeon Cinema - now Big Cinemas. Started in Ambala Cantonment in 19th Century, the store moved to Connaught Place in 1935. At present run by the fifth generation, this store has stories to tell going back to its rich clientele including Maharani Gayatri Devi, Modis, Nandas, Pataudis and Gandhis. This warm, friendly and somewhat messy store with toys all over for all ages definitely makes it a must visit place. I visited this amazing shop last month, and the owner was very, very kind with my friend and me. He addressed us to a good restaurant, close to his shop, but we couldn't come back to thank him, so please are we in time to thank you for your kindness, just now. My childhood years were spent around CP. 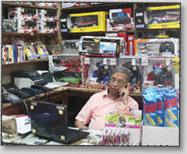 As a kid I was a regular at Ram Chander and Sons toy shop. Owner of the shop is very jovial... one must definitely meet him once in his life...!!! It was a great pleasure meeting you & discovering your amazing shop. My son loved the JCB. In fact, I have recommended all my friends to make a visit your shop whenever they are Delhi. Thank you so much. Thank you very much for the latest TOY product up-dation. I always used to read and watch your product advertisements very enthusiastically. Really I loved it. Well in coming days I will surely visit my favorite Toy station i.e. rcstoys, Delhi even tough I am now in Nasik. Epic toy collection! Visit to your store was a pleasure! Will be back soon!